Start generating more leads from your website today with HubSpot’s free conversion tool, HubSpot Marketing Free. This utopia of lead generation is, in fact, a possibility. To walk you through some of the different options, we’ve detailed several examples of modern lead generation methods below. These ideas provide valuable information to prospects that helps them instead of pushing them to buy from your brand. Below you’ll see Groove’s take on this approach through its interview with the CEO of The Foundation. The folks at Groove frequently interview successful founders and ask really specific questions that everyone can learn from. 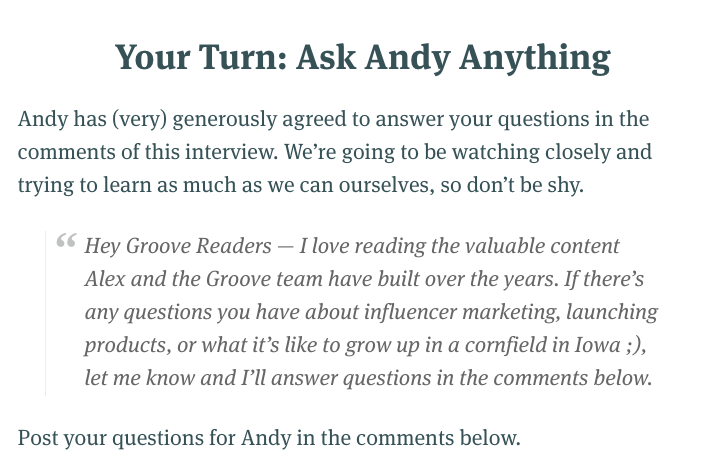 Then, Groove shares those interviews with its potential audience on its blog. Not only is the interview with Drish chock-full of quotes, lessons, and actionable takeaways for entrepreneurs, it also features an “Ask Me Anything” (AMA) with the interview subject in the comments section. This touch helps further Groove’s reputation as a source of expert information among its audience. 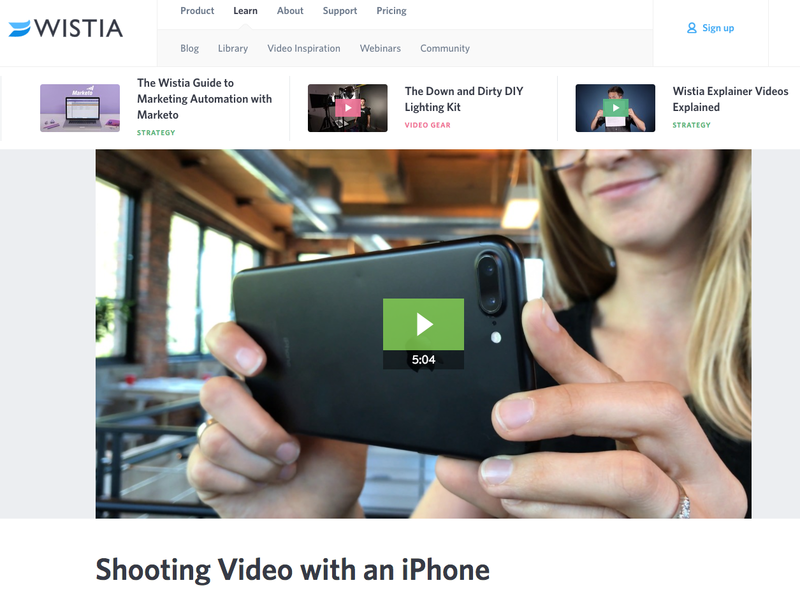 A video hosting and analytics company, Wistia, has a whole series of help videos for companies that want to shoot videos, and it compiled all of those videos into a useful learning center. Here’s one of Wistia’s videos and articles about how to film videos with an iPhone. Because Wistia is a video hosting platform, publishing content strictly about how to use its product would only apply to people who were already customers. Videos like the one above, relevant to anyone who has an iPhone, help the brand create value for people who may not even be familiar with Wistia. If they learn something useful from Wistia once, they’re more likely do it again, and may eventually come to the site ready to purchase a subscription. A great example of this comes from Eastern International College. It created the following quiz to help students make a proper major selection. The quiz provides valuable information for students in a unique and interactive way. 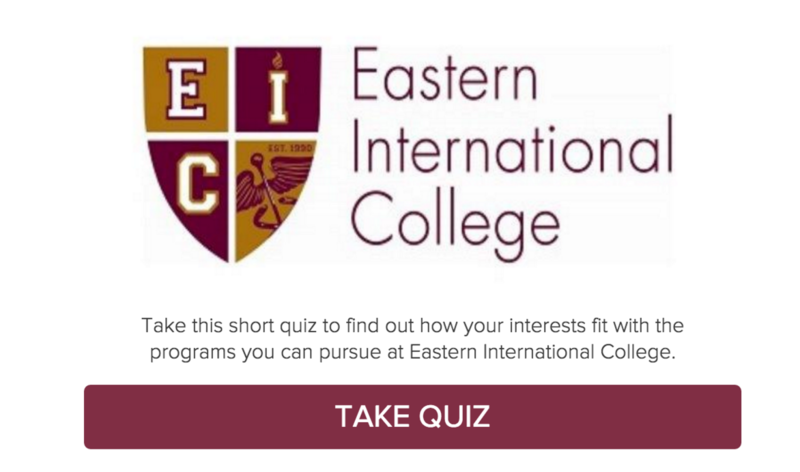 Then, when they fill out a lead information form, they provide specific information about themselves, which Eastern International College can then use to counsel them about the school. 4) Provide best practices for a challenging tactic. When you explore a marketing tactic in a blog post or ebook, you want to know what others are doing to have success with the same method. Compiling those best practices into a list is incredibly useful to the marketer looking to get started in a particular arena. For example, HubSpot created a comprehensive list of SEO best practices from a variety of experts, which aims to help its target audience achieve a greater return on investment from content marketing. The ebook provides a ton of value for readers trying to crack a complicated marketing strategy, and in exchange for their contact information, they get insider tips from a variety of expert sources. 5) Show what’s working for you. Writing a transparent post that pulls back the curtain on something you’ve seen success (or failure) with can prove interesting to potential leads. Other companies going through a similar stage of growth — or approaching your size — can gain a lot of inspiration from posts like this, and ultimately avoid making the same mistakes. Check out this report from Classy below. 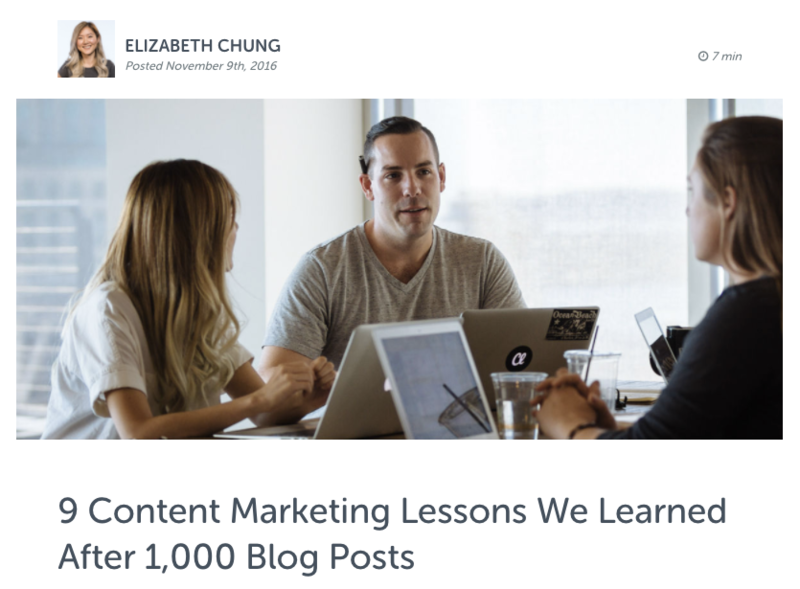 In an effort to provide an insightful resource, it created this analysis of how its blogging strategy had evolved, and what the brand had learned, over the course of 1,000 posts. This blog post from Classy, a fundraising platform for nonprofit organizations, pulls back the curtain on its learnings to share it with the broader content community. 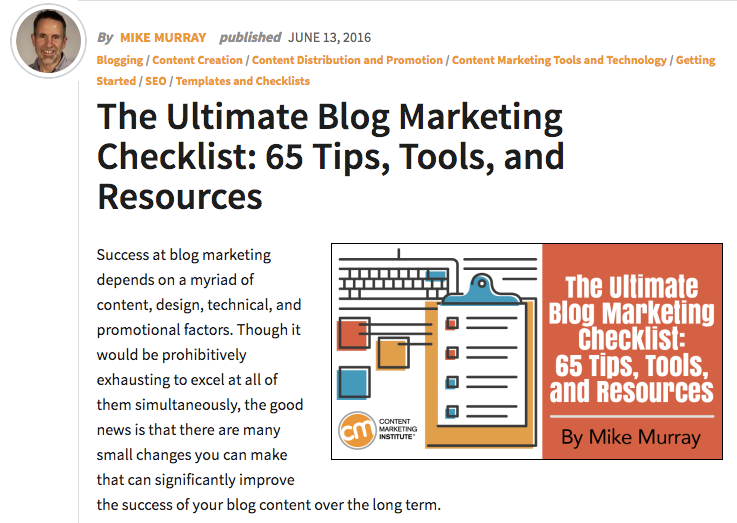 It’s helpful for a blogger in any industry, and prompts readers to download the strategy guide as a final CTA. 6) Create a useful spreadsheet. Compiling a spreadsheet of resources takes forever, so if someone else does it for you, it’s easy to see the value. 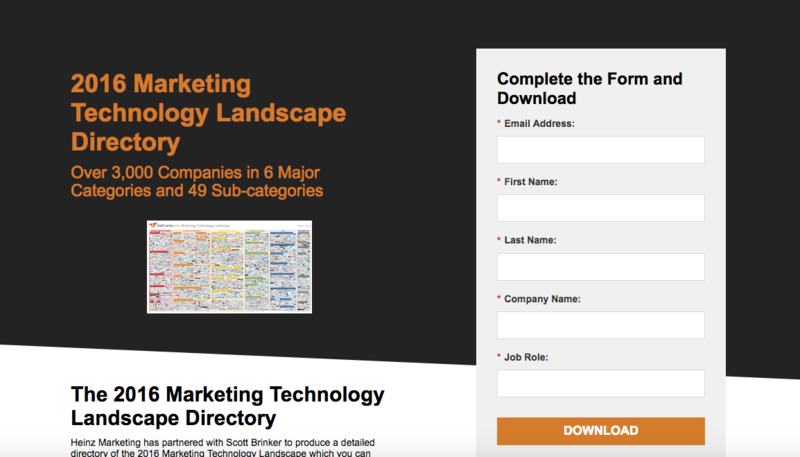 Heinz Marketing created an easy-reference spreadsheet out of a cool infographic (a map of the marketing technology landscape) and made it available in return for an opt-in. Different people have different preferences about how they like to consume content, and by making the information more easily accessible to its audience, Heinz Marketing made a highly valuable piece of content that helped to generate leads. 7) Offer a deep-dive answer for a tough question. You can find the answer to any question you might have on the internet. But how many really good answers are out there? Taking the time to create an in-depth, step-by-step article that answers a burning question for your prospect serves as an opportunity to generate a lead. After all, the company that provides the best answer will often get your business, right? A great example of this method in action comes from the folks at Interact. 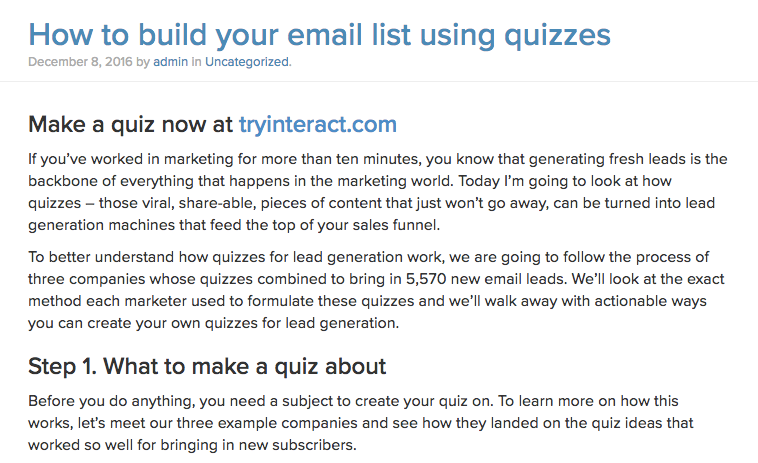 In an effort to explain how to make quizzes, Interact created the following in-depth blog post which dives into heavy detail about how quizzes can build an email list. Email marketing plays a huge role in content marketing success, and this blog post provides a helpful breakdown of how to use quizzes to make emails more interesting. Interact’s audience will keep coming back to the blog for more insight and instruction and might eventually purchase products from the trusted company. 8) Create a worksheet that simplifies a process. Here’s a great example from GoDaddy. 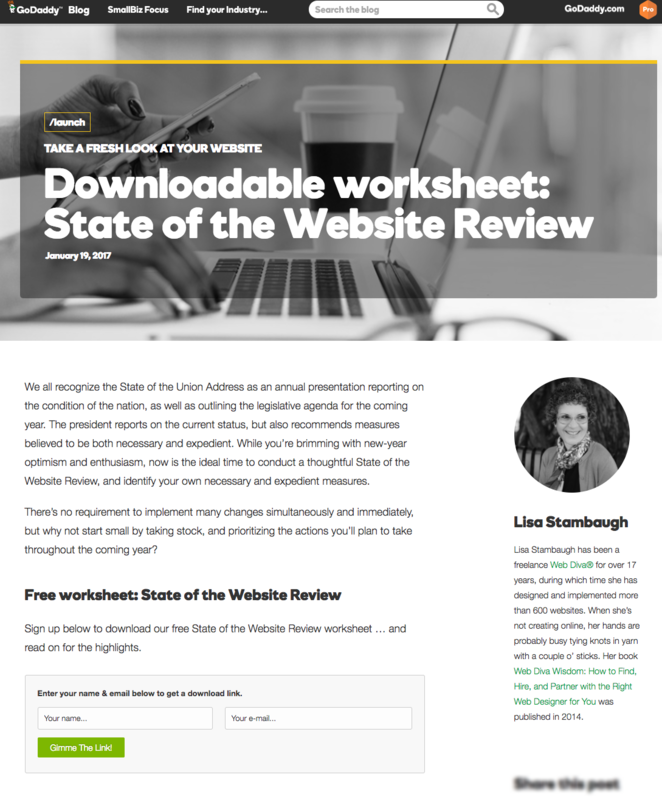 It created a template for reviewing your website that’s focused on content and design. You can take a look at how GoDaddy did this below. This blog post provides a ton of valuable information. Then, readers have the option to share their information in exchange for the worksheet. 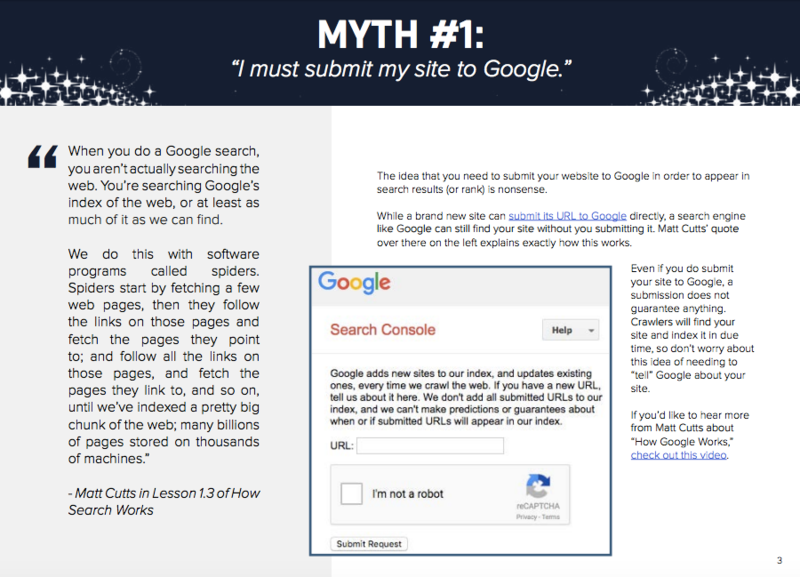 This worksheet converts because it’s helpful and makes visitors want to get more information from a great resource. 9) Create a list of useful tools. It’s easy to brag about the tools your company offers, but when you take the initiative and explore other helpful tools your audience could be using, it proves that you prioritize their success over your own self-promotion. In return, you are also attracting the kind of audience that is looking for solutions like yours, which could drive leads. 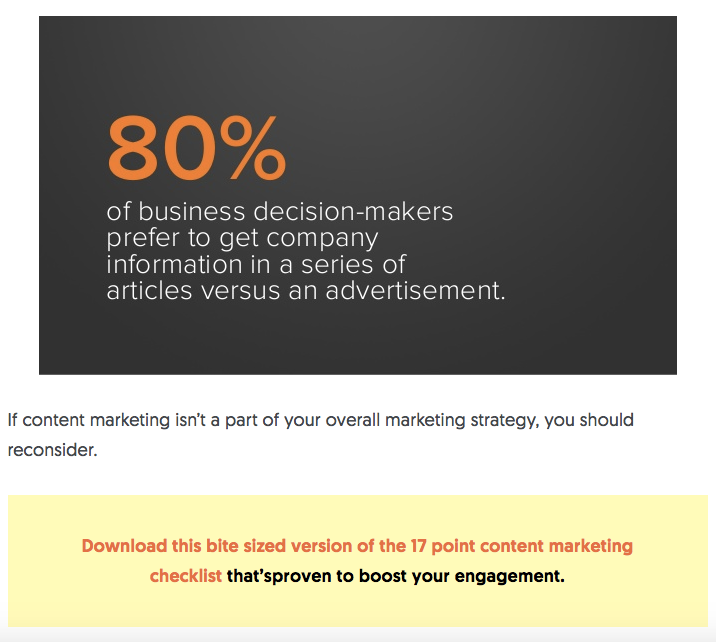 Below you’ll find a great example of this in action from the Content Marketing Institute. 10) Compile examples for people to learn from. Finding effective examples to learn from can be extremely valuable, but also very difficult. A list of best practices in your industry is an excellent way to drive prospects to your domain where they can opt-in. Kapost put together “The Kapost 50,” a list of top B2B content marketing examples, as a resource to inspire site visitors to opt-in and be successful with their own marketing strategies. Content marketers are looking for examples of brands creating content well, especially in the B2B space, and the Kapost 50 calls out particular examples of top content every year. The blog post drives traffic with its clever site copy, and the brand inspiration and helpful examples make visitors want to keep coming back for more. 11) Create a valuable email course. A well-developed email course is like gaining access to a real class — for free. For busy marketers, this type of offer can prove to be really valuable. This approach tends to work well for in-depth topics that really should be learned in a class-like environment. Check out the course from Buffer below. Buffer gives away 25 social media strategies in 25 days in exchange for an opt-in. Buffer created the email course to repurpose blog content into smaller, more digestible pieces. The email course helps people with different content consumption styles get the same valuable information that’s on Buffer’s blog, and it helps Buffer generate new leads to engage with over email. The trick? Make sure what you’re giving away is something people actually want. For example, eWebDesign put together a giveaway of conversion rate optimization (CRO) software that is highly useful to its target demographic. 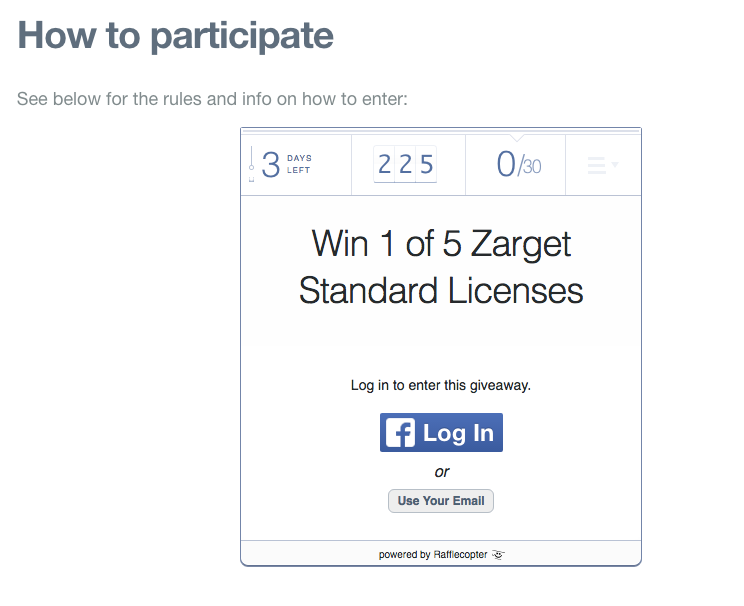 The giveaway generates leads via email subscriptions and social media engagement, and it’s a win-win for eWebDesign. Whether a user wins or loses the giveaway, they will continue to engage with the brand in hopes of winning future giveaways. Meanwhile, eWebDesign can grow its email list to continue outreach to subscribers with more targeted content about CRO. 13) Create a template to simplify an everyday process. There are certain templates you use everyday in business — employee schedule, content calendar, market research sheets — that can be a pain to build yourself. 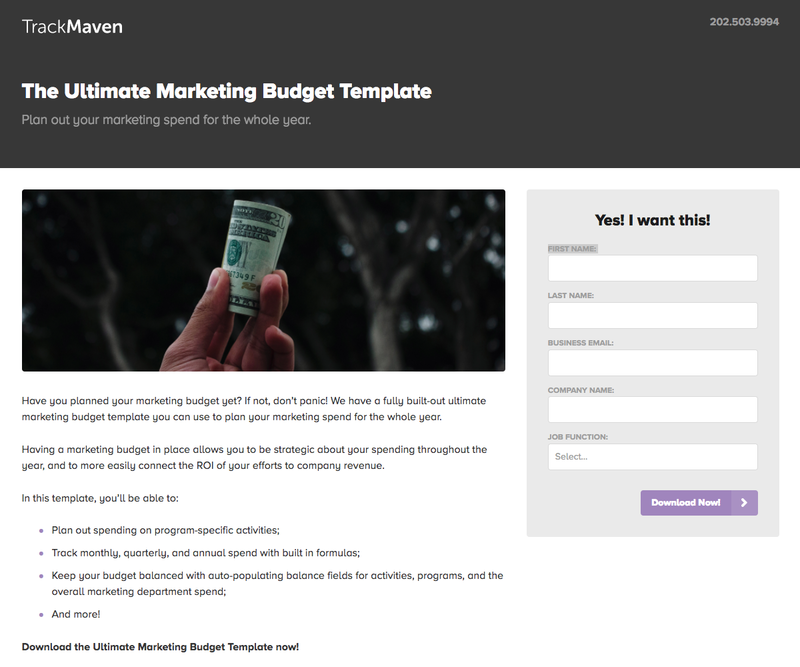 Every marketing organization needs to set a budget, and this template from TrackMaven makes that job a little bit easier. For TrackMaven, the template helps get its brand in front of more people to continue nurturing them with relevant content. 14) Offer a free trial. Free trials of a brand’s services help get a prospect’s foot halfway through the door. If the trial helps them and provides great value, they’re more likely to purchase the full product and become a customer. Touchless buying is popular among prospects who want to stay online and off the phone. By creating a free trial, a brand’s site can do its own selling and encourage buying in a low-pressure way. BuzzSumo presents a wealth of information on this offer page to make the case for why brands should use the product. The page is loaded with examples and data about BuzzSumo to answer all of the prospect’s questions without them having to pick up a phone and speak to a salesperson. Best of all, the trial doesn’t require the user to enter their payment information, so users who sign up don’t have to worry about an unexpected credit card charge. Who doesn’t have a running to-do list that sometimes gets a little bit too long? If someone runs a content marketing strategy, you can be sure there’s a lot that goes into it. Neil Patel created a handy checklist that marketers can download and use for easy reference at work every day. 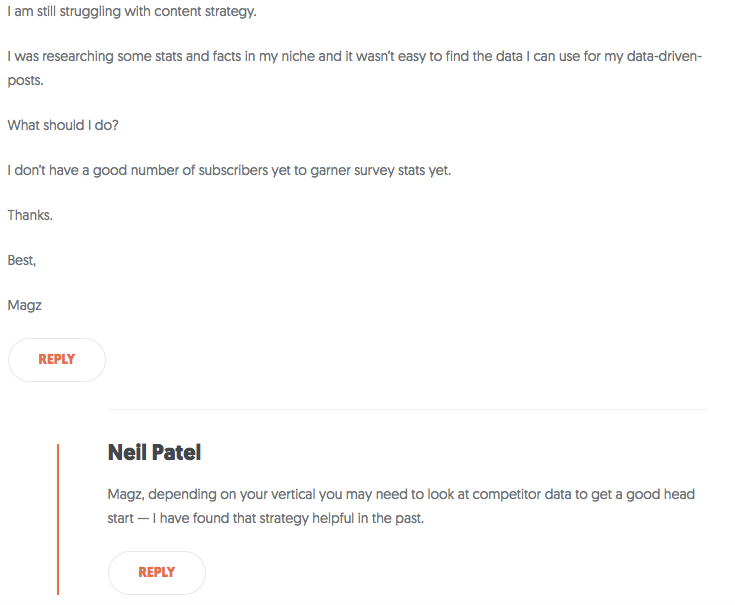 Patel uses the article to prove his brand’s expertise on the subject to encourage checklist downloads, and he answers reader questions in the blog post comments to engage with readers and make his brand seem even more helpful. Whichever lead generation strategy you experiment with next, make sure the content is useful to your audience so they’ll return to your website again in the future. For more lead generation ideas, check out HubSpot’s guide to generating more business here. Have you experimented with any of these methods? What tactics have you found to be effective? Share with us in the comments section below.